Who wouldn’t love to have full, fluttery lashes? They accentuate your eyes, give you a flirty wink and can make you look much more glamorous in a manner of seconds. Whether you’re waking up, at the spa, or even going to the gym, eyelash extensions can amp up your appearance for any of your daily activities! Big beautiful eyelashes continue to be one of the hottest beauty must-haves for those planning their I-do’s and their bridal parties. Here at MAE we love eyelash extensions as an accessory from daily wear to special events! Our in-house fashion model and image consultant Tiffany has had them for more than fifteen months straight! We love the ease of waking up feeling beautiful and ready for the day. Now, we know you’re ready to commit, but like any commitment, there are considerations to be weighed before diving in. We’re here to help guide you through your options. Not only do you wake up with beautiful lashes, but you don’t even have to worry about bothering with mascara. Most lash extensions are black, so you automatically get that beautifully coated look. Whether preparing for a big event, looking to compliment beachy waves on your honeymoon—or you just want to start every day feeling your best, the contrast between your eye color and dark lashes will make your eyes pop—ALL of the time. “Your artist extends the length and volume of your natural lashes in approximately an hour’s time,” said eyelash artist Bridget Marlowe, “Imagine waking up, simply brushing your teeth and walking out the door, ready for the day." Voila! Another exciting feature of lashes extensions is the fact that they are customizable. You can have them as long, thick and luscious as you want. Personalize your extensions to give your eyes a seductive cat-eye look, feathered, natural, etc. whatever your preference! Consult your lash technician with questions and have an open communication to achieve the lashes of your dreams! Lash extensions may be ideal for your Big Day because they are waterproof so you won’t have to worry about ruining your makeup during teary vows or mascara-streaked dance party photos! Heidi Holley, an Executive Beauty Coach at Sapphire Spa Services, has been doing lashes for 6 years, with brides being a large part of her clientele. 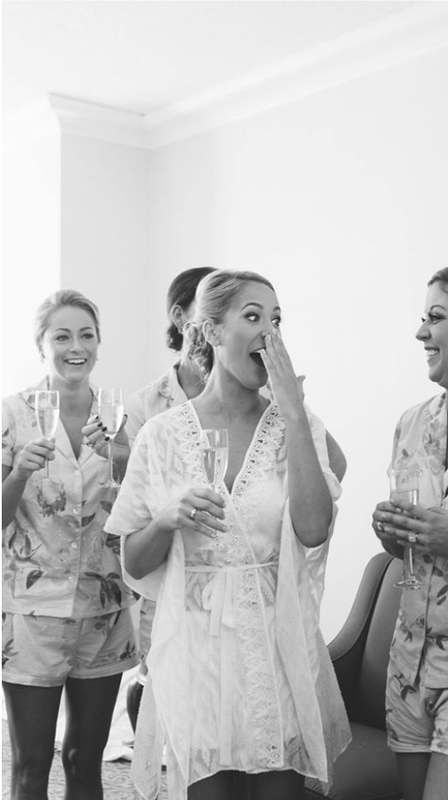 "I encourage all of my brides to get their lashes done one month from the special day, and again on the week of their wedding," Holley shared, "This allows them to test out the variety of lengths and styles of lashes, like classic and volume." One of our favorite details about lash extensions is that they’re semi-permanent - meaning that they can last a long time, depending on how well you take care of them. As long as you don't rub or pick at them, they should last 2-4 weeks if applied properly. For those who have a honeymoon right after their wedding day — extensions are perfect! Not only can you have the lashes applied for your wedding, but they should stay on for the duration of your honeymoon too. Let's be honest, there is some maintenance that goes into having lash extensions. A few things that you will have to do is brush your lashes every so often to keep them in place and from getting tangled. You will also have to be careful to remove all of your eye makeup gently each night to keep it from settling in the base of the extension. To keep your lashes lasting long, try to sleep on your back to avoid rubbing your lashes on your pillow while sleeping. In addition, if you plan on keeping your lashes for longer than the duration of your wedding and honeymoon, plan on scheduling “lash fills” every 2-3 weeks to keep them looking full. Lash fills are what lead us into the first consideration of eyelash extensions: the cost. Eyelash extensions are a luxury beauty item and are priced at a premium. On average, eyelash extensions will run from $150 to $500 for your initial set. From there, lash fills can range from $40 to $200. However, many lash-devotees find it’s well-worth their investment. The application of lash extensions can also be lengthy. Depending on the technician and the amount of experience they have, you can expect your application to take anywhere from 45 minutes to 2 hours. Lash extensions should only be applied and removed by a lash technician that is certified to do so. If getting them applied for your event, be sure to get them done at least one day before you get your makeup done. Do not get your lash extensions wet for at least 24 hours after the application. Although very uncommon, allergic reactions may occur from the glue used for the lashes as well. If you have sensitive eyes or are allergic to glue, lash extensions may not be the best option for you. However, if you develop a reaction, your lash tech will be able to remove the lashes and irritation should subside within a day or two. Unlike strip lashes, lash extensions must adhere to a given lash. Note: Every extension is applied to an individual lash so if you have bare areas within your lash line, it will only stand out more with lash extensions. Finally, consider your lifestyle and upcoming activities, keeping in mind that eyelash extensions will prohibit eye-rubbing. For many, this is a non-issue—and rubbing those peepers is a great habit to break anyway! However, if you’re an avid swimmer or looking forward to water-sports on your honeymoon, eyelash extensions may pose challenges when wiping water away from your eyes. After weighing the pros and cons, make a decision that is right for you. If you’ve decided to follow through with lash extensions, we hope you love them as much as we do! If you are looking for an alternative to eyelash extensions — strip and individual false lashes can be just as beautiful and elegant! While adhesive false lashes are intended for just the day of your event, they are relatively inexpensive and can be applied along with a standard makeup application and typically cost around $20. Adhesive lashes are available in many different lengths and styles that will give you a ton of options for your special day. Go full-glam with “doubled-up” strip lashes or flirty and natural with tapered, individual lashes. Using individual lashes are a great way to customize your lashes to make them look as full and luscious as you desire. For some, the thought of adhering ANYTHING to their eyes is taking it a step too far! Fiber-filled mascaras, such as Younique’s Moodstruck 3D Fiber Lashes+ or Tarte’s Best In Faux Lash Extending Fibers, have a quick and easy application that give completely temporary volume and length. If you have a few months before your big day, consider trying out an eyelash serum to help grow and protect your lashes. Many of our friends have tried RevitaLash and saw great results! MAE Tip: Consult your makeup artist on which type of lashes they believe will look best on you with the look you are trying to achieve for your event. If doing your own makeup, start your search for adhesive lashes ahead of time and practice, practice, practice! Red Cherry Lashes and House of Lashes are two of our favorite brands. Whatever type of lash you decide to bat, we hope that you have an amazing time at your event and feel incredibly beautiful on your Big Day! To see how Marquette Avenue Events can help plan your dream wedding or next special event, please visit us at www.marquetteavenueevents.com or call us at 312-585-7265.